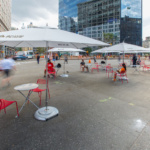 After two years in storage, New York’s Astor Place Cube is back for a few more spins, along with a reconfigured plaza and streetscape that are designed to make high-density urban living more bearable. 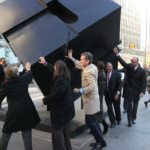 New York City officials held a ribbon-cutting and sculpture-spinning ceremony today to mark the completion of repairs to the rotating Cube sculpture by Bernard “Tony” Rosenthal and the larger $21 million Astor Place/Cooper Square reconstruction project that provides an improved setting for it. Officially known as The Alamo, Rosenthal’s Cube was removed for safe keeping and cleaning on November 25, 2014, so it would be out of the way during plaza reconstruction. 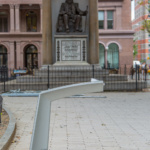 It was returned this month, signaling completion of public improvements designed by Claire Weisz of New York-based WXY, in conjunction with the city’s departments of Design and Construction (DDC), Transportation (DOT), and Parks and Recreation. Trottenberg wistfully recalled her own involvement at Astor Place. After graduating from Barnard in 1986, she said, she worked in publishing near the Wanamaker Annex back when that’s what liberal arts graduates did. 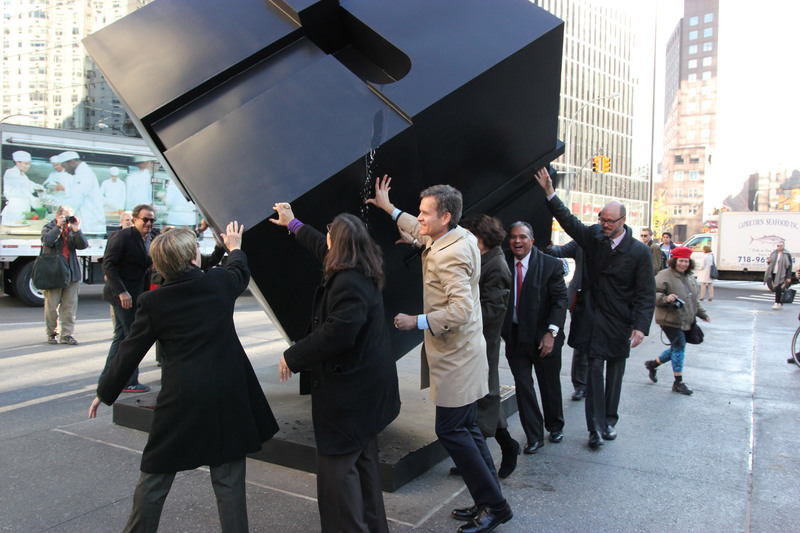 The 15-foot Cube is one of the best-known sculptures in the city, popular for the way it spins on its axis. 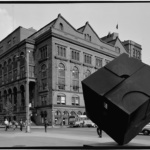 First installed in 1967, the Cube is made of jet-black Cor-Ten steel, weighs 1,800 pounds and spins easily when touched, making it a favorite late night toy for neighboring college students and others. Rosenthal (1914 to 2009) created the Cube as part of Doris C. Freedman’s Sculpture in Environment installation, sponsored by the New York City Administration of Recreation and Cultural Affairs when the East Village neighborhood was a Bohemian haven. 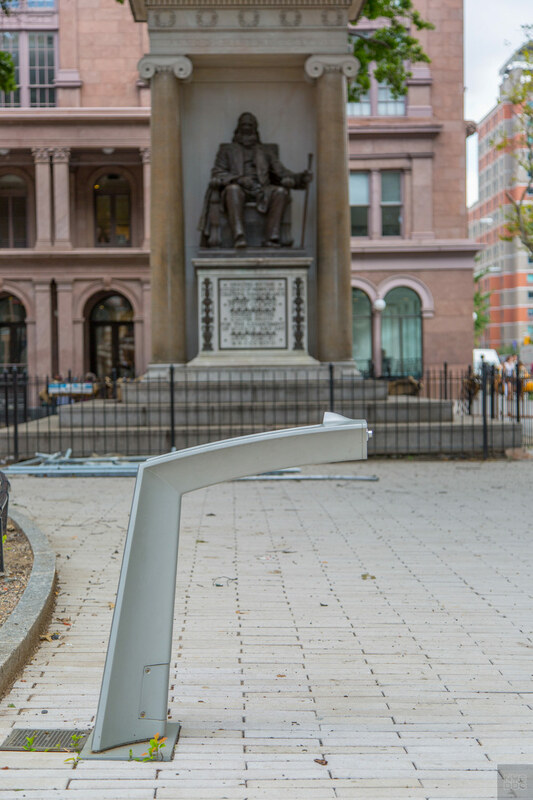 Symbolizing the constant swirl of urban life, it is as contextually emblematic as the Financial District’s 1987 Charging Bull by Arturo Di Modica. 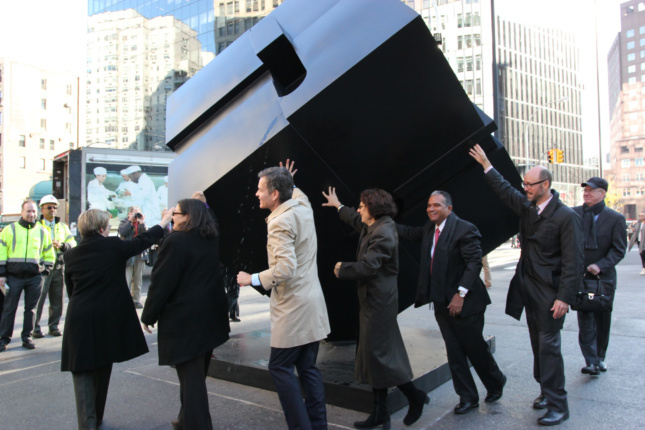 It was the first permanent contemporary outdoor sculpture installed in the city of New York. 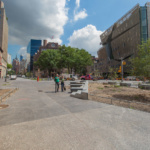 The reconstruction of Astor Place and Cooper Square were completed as part of an effort to upgrade infrastructure throughout New York City, to give residents and visitors public spaces that provide a relief as the city becomes more densely developed. The city has a goal of ensuring that all New Yorkers live within a 10-minute walk of quality open space. 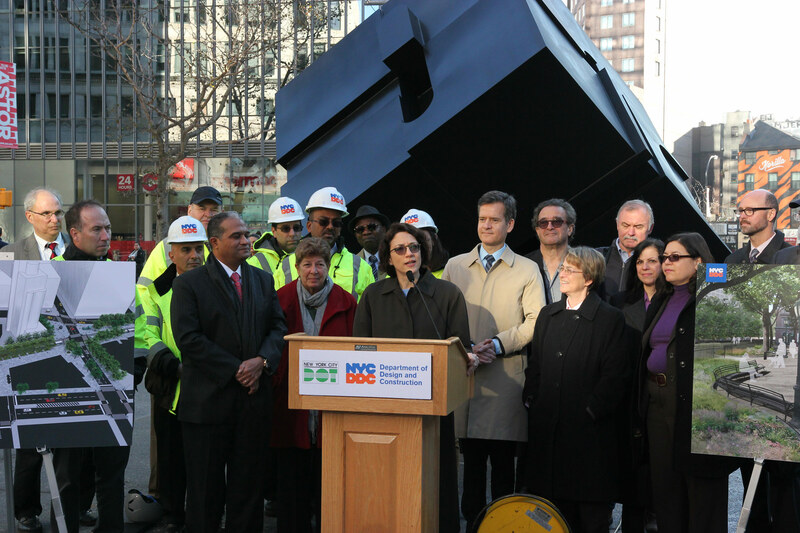 The Department of Design and Construction managed the project for Transportation and Parks. The community enhancement project created two new pedestrian plazas and expanded and renovated two others, bringing 42,000 square feet of new pedestrian space to the neighborhood. 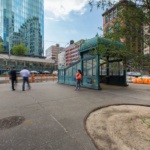 The redesign incorporated an existing subway station and created a safer configuration for vehicular and pedestrian traffic. 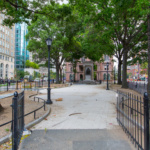 It introduced larger sidewalks; 16,000 square feet of planting areas with new trees and automated, in-ground irrigation systems; 6,700 square feet of permeable pavement; 2,100 square feet of curbside rain gardens for improved drainage; and racks for more than 100 bikes. The Cube was renovated at a cost of $180,000. 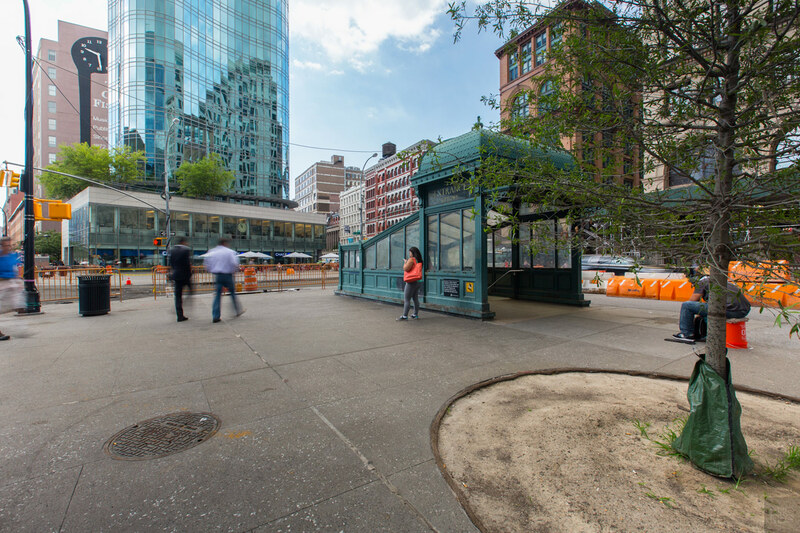 To reimagine Astor Place, the city agencies turned to WXY, an architecture and urban design firm with a track record for working in complicated parts of the public realm. The redesign was intended to reduce stress for everyone in the area. 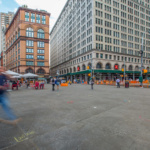 It creates sidewalks and roadways that are more clearly delineated to calm and guide drivers, and it provides more space for pedestrians, especially in Astor Place’s Alamo Plaza. 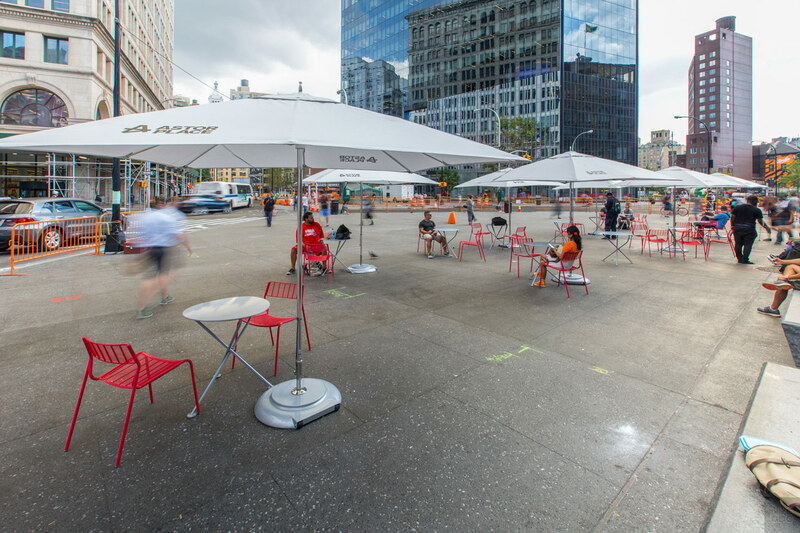 Custom-designed tables, chairs, and umbrellas encourage pedestrians to stop and take in the view. 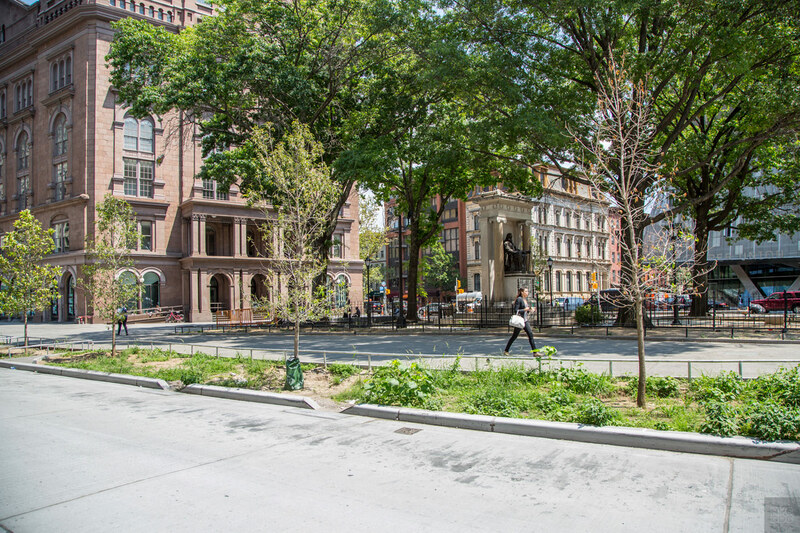 There are also more trees and benches in Astor Place. At the southern tip of the Astor Place area is Cooper Triangle and Village Plaza. Cooper Triangle got new street fixtures, including steps that provide seating and meeting areas for pedestrians. More pedestrian space was added by narrowing the width of the adjacent road. 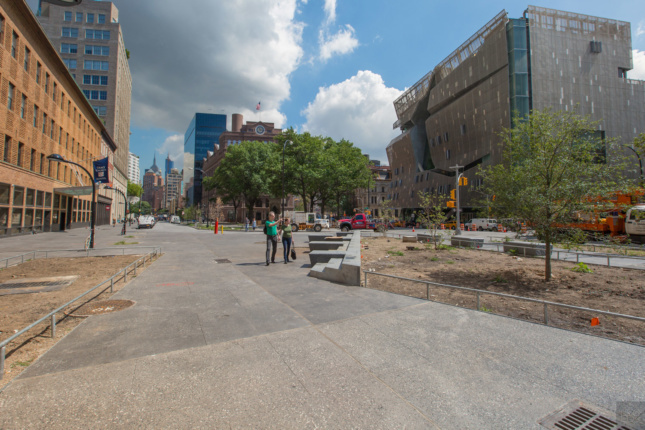 Reconstruction of Astor Place began in 2013 after the local Community Board approved the plan. Besides moving public art, work included relocating underground utilities and installing new features such as lighting, bicycle racks, and plantings. Planners say in-depth traffic studies were a key step in redesigning and rebuilding roadways to calm the flow of cars. 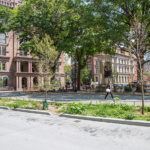 While Astor Place is a high profile project, planners say, areas throughout New York City are receiving similar treatment on a smaller scale. 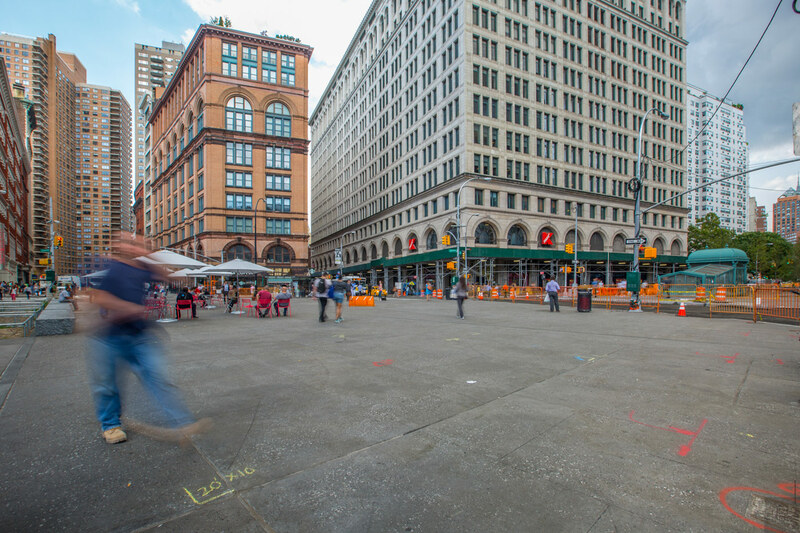 The DDC launched its Plaza Program in 2008, inviting New Yorkers to nominate their own neighborhoods for a plaza redesign. 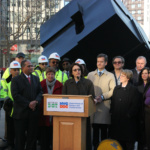 Earlier this year, the DDC and DOT also completed Fordham Plaza in the Bronx and La Plaza de las Americas in Manhattan. Others in the works include George B. Post Plaza, Lowery and Bliss Plazas, Putnam Plaza, Roosevelt Island Plaza, and Times Plaza. 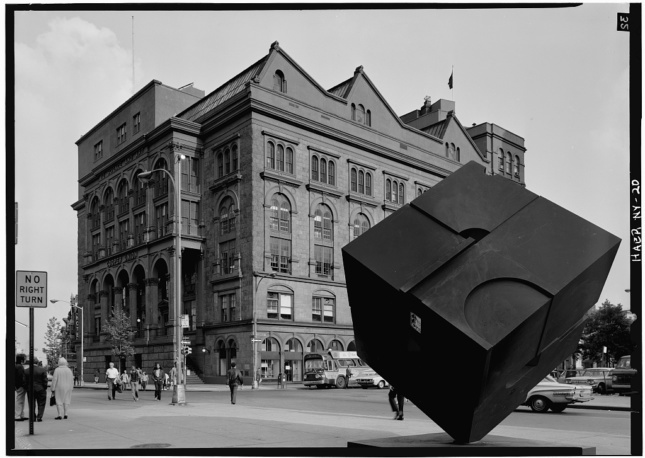 Although the Cube was immortalized as a mosaic landmark at the nearby 8th Street-NYU Subway Station by artist Timothy Snell in his Broadway Diary mosaics (2002, for the MTA Arts & Design program), residents have long had concerns that the frequently and roughly used sculpture may change with the area. An Alexander Calder sculpture was planned in 2011 to take the place of the Film Academy Café during 51 Astor’s development but never arrived. The lobby of that building itself now features Jeff Koons’s whimsical 16-foot-tall Balloon Rabbit (Red), 2005-2010, ironically greeting all visitors to Big Blue. 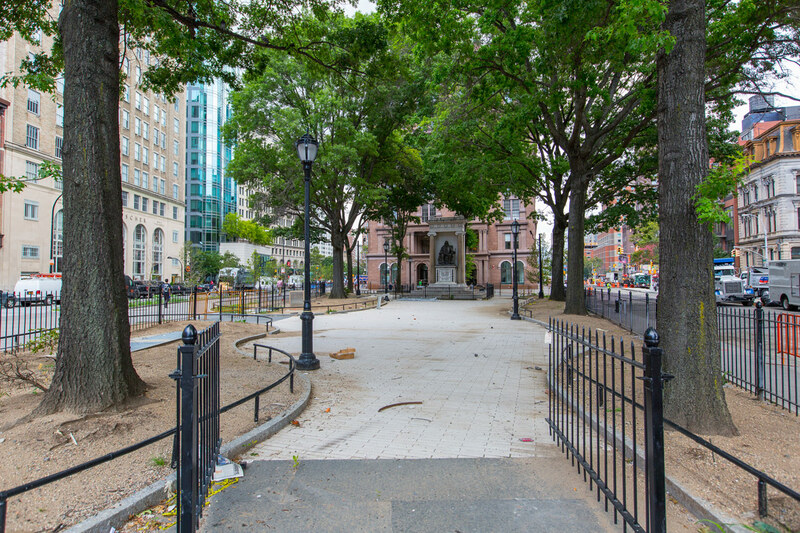 During the same plaza redevelopment in 2014 that prompted the Cube’s temporary disappearance, the Department of Transportation removed around 6 light posts encased with episodes of Mosaic Trail, a classic, yet illegally installed hallmark of the East Village begun around 1984 by local street artist Jim Power.